In this solo dining adventure, Gary has a satisfying start to his morning at Santa Rosa’s Omelette Express. Let’s do a quick run down of all the different “breakfasts” my friends and I had while we were in the Bay Area – bánh mì, porchetta sandwiches, and dim sum (twice). 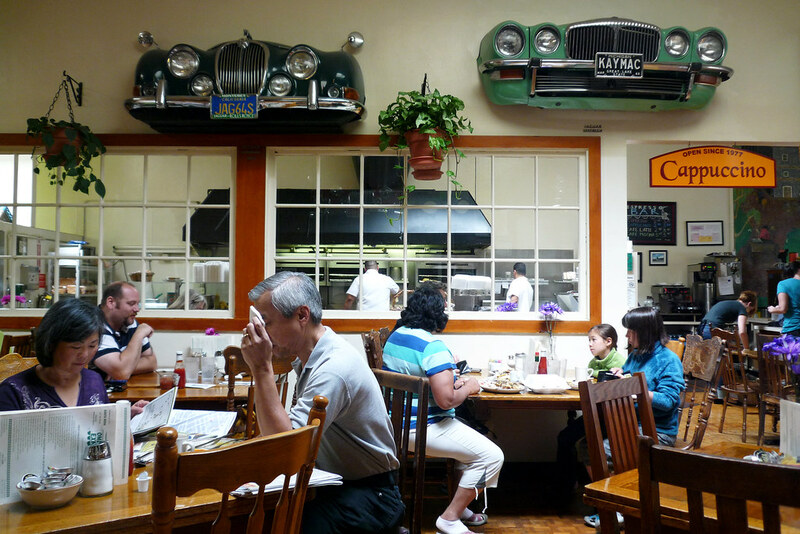 We did, however, manage to have one “normal” breakfast while we were out there at Omelette Express in Santa Rosa. JP and I first stumbled upon Omelette Express during our trip to San Francisco over two years ago. Much like this time, we had stayed in Santa Rosa the night before and were looking for a solid base before kicking off a day of drinking (Russian River the first time, wine country this time). That time it was a Sunday morning (a little after 9 am) and there was a large crowd gathered outside waiting for a table. I always take a that as a sign that it’s a good place or, at the very least, a crowd-pleaser. This time, as it was a Thursday morning, it wasn’t nearly as busy but considering that most people work for a living, it wasn’t as empty as one would expect it to be. We were seated immediately, ordered quickly, and, just a few minutes later, food was being set down onto our table. When I go out to breakfast, I like to have eggs over easy, home fries, and some sort of meat (usually bacon, sometimes corned beef hash). Here, they had something I’d never had before – linguisa, a Portuguese cured pork sausage seasoned with onions, garlic, and paprika. Of course, I had to have that instead of the bacon that had become de rigueur for me. It’s prepared here the standard way (or so I’ve read) – sliced length-wise (three times, in this case) and then grilled. Here, it’s a little charred at some points but otherwise it’s an excellent choice of meat for breakfast. 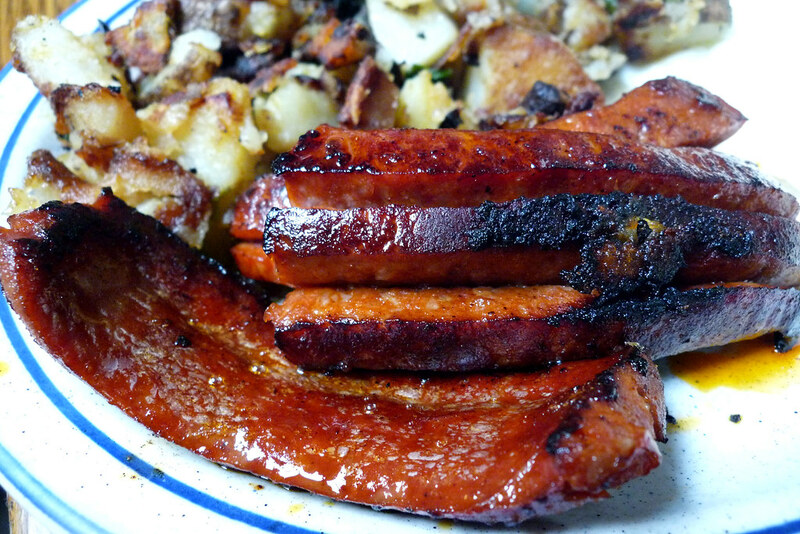 After all, it’s salty, spicy, and greasy which is what you want from your breakfast meat, no? 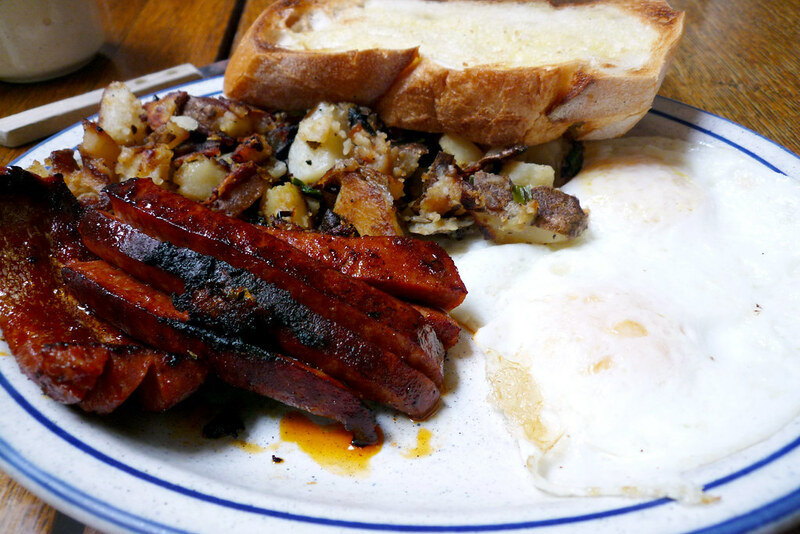 Everything else on the plate was solid – the eggs were cooked over easy properly and the home fries were a good mix of soft and crispy well-seasoned potatoes. Absolutely no complaints here. It’s hard for me to really judge breakfast places – after all, if you don’t screw up the eggs and the home fries, there’s really no reason for complaint. I don’t have a solid grasp on what makes for excellent/amazing breakfast as opposed to a good one except that I know it when I have it. I wouldn’t classify Omelette Express as the former but it’s a notch above good. Delving into baseball analogies (because I love the sport), I’d say that while they may not hit home runs, they’re solid doubles and triples hitters and, in baseball, that’s enough to be very good at what you do. Omelette Express. 112 4th Street, Santa Rosa, CA 95401. [Show/Hide Map] (707) 525-1690.